The best Finish Nailer tools are designed to nail moldings and smaller trim boards onto assemblies with ease. The thin nails are driven through the trim board into hardwood, plywood or any other wood material. This is much faster than using a standard hammer and nails and the finish nailer is designed for one-handed uses which leaves your other hand free to hold moldings and trims in place. View the Best Finish Nailer on the Market, Below. 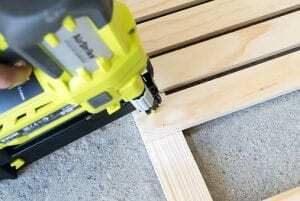 What is the greatest Finish Nailer? What is a Finishing nail gun used For? What size Finishing nails for door Trim? What size Finish Nailer do I Need? Can a Finish Nailer be used for Framing? Do all Finish Nailers need a Compressor? 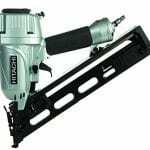 The Hitachi NT65MA4 Angled Finish Nailer is durable and effective for installing trim moldings and window or door casings. This finish nailer accepts 15 gauge nails ranging in length from 1-1/4 inch to 2-1/2 inch at 34 inches. The angled magazine allows the operator to working tight corners and confined spaces with ease. The nailer is easy to load and takes up to 100 nails at a time. A tool-free drive adjustment dial is located under the elastomeric grip non-slip grip trigger. Depending on the density of the material and the air pressure required, adjustments can be made. Nails can then be set consistently for improved control and a professional finish. The 360 degree fully adjustable exhaust should be directed away from the user at all times to avoid debris and oil. This finish nailer requires occasional lubrication with oil to keep the tool functioning at it its peak. A selective actuation switch allows for sequential or contact fastening without any additional tools required. This finish nailer comes with a unique air duster button which is located above the grip. The air duster allows air from to be expelled from a hole in the front of the tool. Dust and debris can be cleared away from the work surface using this feature. See more information on Hitachi NT65MA4. An innovative product from Hitachi which is jam packed with features. This tool weighs only 4.2 lbs and has an angled magazine to allow the user to get into those tight spaces more comfortably and without strain. For professional use on chair rails, window casings and exterior trim. The Dewalt DC618K Cordless Angled Finish Nailer Kit has a good overall balance and will handle any job with ease. The engine design allows the tool to work fast and consistently on both hard and soft joints. No more trying to remove a jammed nail with a screw driver or tool wrench with this tool’s very accessible nose piece, you can quickly remove any jammed nails. The 20 degree angled, rear loading magazine can take up to 120 DEWALT and Paslode nails. A contact trip lock-off safety feature allows the trigger to be disabled when not in use. This finish nailer has a choice between two modes; sequential placements of each nail or bump operating mode for maximum speed. A six position dial enables you to select the best depth setting for different sorts of applications without having to re-acquire each depth setting. At 8.5 pounds, this nailer is slightly heavier than its counterparts but still light weight enough to maneuver easily. An integrated set of LED lights allow for perfect placement in low lit or shadowy areas. This finish nailer comes standard with an 18V XRP battery and a one hour charger. The XRP battery can be used with any other 18V DEWALT tool which allows you to expand your tool system by adding other cordless tools from DEWALT. See more information on DEWALT DC618K Kit. This is most definitely a premium addition to the Dewalt Cordless tool range. Finish jobs off like a pro every time and without the hassle of gas or compressor cables. This finish nailer comes with a three year limited warranty and two year service warranty and is battery operated. The 18V battery can be used with any other 18V DEWALT Cordless tool which makes it perfect for jobs where there is no available power source. The NuMax SFN64 Straight Finish Nailer is designed to fire 16 gauge straight finish nails anywhere from 1 to 2.5 inches. This straight finish nailer is perfect for finishing off interior and exterior projects. It can be used on shoe and crown moldings as well as window casings or chair rail molding. Thanks to the nails small gauge which basically disappears into the wood, you will spend less time filling in and sanding holes. Even though these nails are small in size, they are quite strong and will soon become an essential part of your toolbox. The tool-free, 360 degree, adjustable exhaust conveniently directs dust and debris away from the user and the no-mar tip protects sensitive work surfaces. This finish nailer has a light weight aluminum design cylinder with a one piece drive blade and rubber o-rings for extra durability. The sequential firing mode is designed to fire a single fastener at a time, allowing you to accurately place fasteners every time. For added accuracy, we recommend using a level with a laser for correct placement every time. The firing depth is customizable for every single project, ensuring a consistent driving depth at all times. The integrated quick release-latch allows you to easily access and remove jams without needing to take the finish nailer apart. The high capacity magazine can take up to 100 straight finish nails which mean longer working periods between reloads and the anti-dust cap keeps the internal parts of your tool clean, even during storage. See more information on NuMax SFN64. A must have for every workshop or professional dealing with trim and molding applications. The high capacity magazine can take up to 100 straight finish nails which mean longer working periods between reloads and the anti-dust cap keeps the internal parts of your tool clean, even during storage. The BOSTITCH 62FNK-2 Finish Nailer delivers a professional finish every time. This is the best tool for taking care of the finer details. This finish nailer comes with a choice of four angled profile tips to ensure a pristine finish and best drive. This finish nailer features an oil free compressor which makes it easy to maintain and mess free. This nailer has adjustable nail-depth settings and an operating range of 70 to 120 PSI. You can easily dial in the correct depth or a variety of applications such as challenging hardwood. The tool-free magazine holds up to 130 nails measuring 1.25 to 2.25 inches in length. This means that you can work for an extended period of time before having to reload which makes the job faster and more consistent. The magazine removes easily, which makes clearing up jams fast and simple. Thanks to its magnesium construction, this nailer weighs only 3.8 pounds and is light enough to use for extended periods or for overhead applications such as hanging shutters and mounting crown molding. The nailer comes with a protective carrying case for safe storage while not in use or when being transported. This nailer is covered by a whopping seven year limited warranty and comes standard with four profile tips, no mar tips and fasteners. See more information on BOSTITCH N62FNK-2. The Paslode 902400 Cordless Finish Nailer features the new In-Can System which is easier to install for reliable use. This nailer weighs 4.5 lbs with the battery included which makes it very light weight and easy to handle. Pro- Grade depth of drive adjustment for driving 1-1/4 – 2-1/2 inch, 16 gauge angled finish nails. There is no hose or compressor needed for this model which allows for total freedom of use. This nailer is covered by a 5 year manufacturer’s warranty and comes standard with a durable plastic carrying case to keep your unit safe and clean when not in use. Lithium-ion Technology allows for better power management and shorter charging times. This nailer features an on/off battery lock to further conserve power which means you can work for longer periods before it requires charging. The no-mar tip protects surfaces against dinging and scratching while the angle magazine makes it easier to work in confined spaces. The magazine has a nail capacity of up to 100 nails and the fuel cell life will last for up to approximately 1200 nails. It takes one hour for the nailer to charge which means you spend more time working than your drill does on charge. See more information on Paslode 902400. This nailer is definitely a tool without hassles. It is battery powered, which means no more struggling with compressors and extension cords. Just flip the switch and you are ready to go. Excellent for door and window trims as well as paneling and crown modeling. The DEWALT D51257K 16 Gauge Finish Nailer is a pneumatic unit which is powered by compressed air and can be run at an operating pressure of 70 to 120 PSI. The magazine can hold up to 100 16 gauge finish nails and accepts nail lengths from 1 inch to 2 and half inches. This nailer does not use oil which lessens the chances of stains on your finished projects. The 360 degree rotating exhaust adjusts easily to keep wood dust, moisture and debris pointed away from you. The nail depth adjustment is located directly on the tool which means fewer trips to and from the compressor. A no-mar tip feature keeps your project surface safe from dings and scratches while the front of the nail gun opens easily to safely remove any jammed fasteners. The trigger lock ensures that the nail gun is safe to use for everyone in the vicinity. Since the nail gun runs on air, there is no need for pricey batteries or lengthy charging times while your project is waiting. See more information on DEWALT D51257K. This nailer sports all of the features you would find on a bigger, more expensive nail finisher. Affordable and easy to use, this is the best tool for anyone looking for a cheaper yet reliable option. It is a genuine quality nailer that can be used on a variety of applications such as crown moldings and other detail work you could possibly think of. The Senco 4G0001N 15 Gauge Finish Nailer is lightweight yet durable thanks to its magnesium housing cover. This nailer has been redesigned with a new long life driver and main body as well a new and improved trigger reach. NeverLube technology means that you will never have to lubricate this nail gun and you don’t need to worry about oil spills ruining your project. EZ-Clear latch technology enables the user to clear any jammed fasteners safely and easily and two No-Mar pads protect work material and surfaces. The adjustable exhaust can rotate up to 360 degrees to keep dust and debris away from the users face. A belt hook provides convenient storage and an integrated construction ruler takes care of quick measurements. This nailer features a balanced, ergonomic design with a premium custom grip and trigger to ensure maximum comfort and confidence while using the tool. The straight angle magazine can take up to 100 15 gauge finish nails and operates in restrictive sequential firing mode. An operating pressure of 70 to 120 PSI drives both bright and galvanized steel. The dial in depth adjustment thumb wheel guarantees precise drives from start to finish. See more information on Senco 4G0001N. This nailer makes light work of any finishing applications thanks to its light weight ergonomic shape and well balanced design. Get precise, efficient results without damaging your work surface. See even the toughest of jobs through to the very end with this uniquely designed tool. The BOSTITCH BTFP71917 16 GA Finish Nailer Kit drives 16 GA nails measuring 1-1/4 in to 2-1/2 inches in length. A smaller nose provides easy nail placement using Smart Point Technology and oil free operation reduces the risk of oil spills on finished surfaces. A tool-free jam release mechanism allows for safe and easy removal of jammed fasteners. The Dial-a-Depth feature provides controlled countersinking of nails while the selectable trigger system enables sequential or contact operation. The 360 degree adjustable exhaust keeps dust and debris away from your face while working and the adjustable belt hook comes with an integrated pencil for hassle free measuring and marking. The 80 percent smaller head size enables the user to reach tight spaces and to easily see where nails are being driven providing better visibility of the work surface. Smart Point allows the user to actuate the tool without punching against the work surface, significantly reducing damage to finished work surfaces. Weighing only 3.9lbs, this nailer is extremely light weight which makes it the best finishing tool for overhead jobs. See more information on BOSTITCH BTFP71917. An excellent innovation from BOSTITCH as far as features and size are concerned. The smaller head size makes it possible to reach tight spaces while still maintaining visibility of the work surface. A small, nifty gadget used to add those finishing touches to a project. The BOSTITCH BTFP72156 Angle Finish Nailer has an 80 percent smaller nose which means easier nail placement due to better visibility. There is no need to push against a project for actuation, causing much less damage to your end project. This nailer drives 15 GA “FN” style Angled Finish Nails from 1-1/4inch to 2-1/2 inches in length. A tool-free jam release feature enables the user to safely and easily remove any jammed fasteners without needing any extra tools. Thanks to the trademark DIAL-A-Depth adjustment control, nails can precisely countersink. The smaller angled head allows the nailer to perform in tight and constricted spaces. It also makes it easier to see exactly where the nails are being driven which is an excellent feature when working in a confined space or at an abnormal angle. A selectable trigger allows for sequential or contact mode options. Weighing 4.32 pounds, this nailer is slightly heavier than other BOSTITXCH models but is still light weight enough to be used in overhead projects thanks to its angled design which gives the best reach in tricky spaces. See more information on BOSTITCH BTFP72156. A good nailer overall with decent power and a better price compared to its counterparts. Installations such as baseboard are easily achieved when using this nailer. Thanks to the smaller, angled head, users can now access those tight spaces like never before. The Freeman PFN1564 15GA Angle Finish Nailer is the best tool for finishing off finer applications such as moldings or cabinetry. Thanks to its Die-cast aluminum housing and anodized aluminum parts which make it extremely durable yet light weight. This nailer features tool-free depth adjustment as well as nose access for easy removal of jammed fasteners. The oil free design keeps maintenance to a minimum and the 360 degree adjustable exhaust propels dust and debris away from the users face and body. It is compatible with 1-1/4 inch to 2-1/2inch tape or glue collated 15 gauge nails. The unique 34 degree angled head allows for precision fastening in small or confined areas. This air nailer comes standard with a dust cap and internal air filter which allows cleaner operation at an operating pressure of between 70 to 110 psi. The dust cap keeps the tool clean and dusts free while not in use or while being transported. This nailer weighs only 4.75lbs and has a soft comfortable grip handle, making it a pleasure to use for extended periods of time or in awkward positions such as overhead applications. Other features include a dual mode trigger for easy selection between two firing modes. A No-Mar tip protects your finished surfaces against damage while working and the nailer fits into a plastic storage case for easy storage and transport. See more information on Freeman PFN1564. A great tool packed with plenty of features such as a 34 degree angled magazine to allow users to reach tight corners easily and effectively. Perfect for topping off projects such as moldings, chair rails, cabinetry and other fine finish applications. The No-mar tip feature protects your project from dings and scratches, giving you a professionally finished project every time. Sometimes your project will call for a finish nailer that has a little more finesse than your standard hammer and nails, this is how you know it’s time to think about getting a finish nailer. These nailers are the best tools for finishing off your beloved projects in a professional manner. Depending on your preference, you can choose between air powered and cordless finish nailers. Taking a look at the type of project you will be doing will help you determine what kind of finish nailer you will need. An innovative product from Hitachi which is jam packed with features, the Hitachi NT65MA4 Angled Finish Nailer is the best tool in its class. This finish nailer weighs only 4.2 lbs and has an angled magazine to allow the user to get into those tight spaces more comfortably and without strain. For professional use on chair rails, window casings and exterior trim. These tools are primarily used for finishing off the finer detail work of mostly wooden or ply board applications. Their thin nails can be driven through the trim board and into soft and hardwoods. The best thing about finish nailers are they leave behind a very small footprint which can be filled in easily for a smoother finish. These nailers have safety noses that need to be depressed before they are triggered and their no mar tips prevent the nailer from damaging the surface you are working on. Basically a finish nailer is a smaller version of their standard nail gun counter parts. Trim nailers are categorized by the thickness or “gauge” of the nails they shoot. The rule of thumb is that the bigger the gauge number, the smaller the nail it uses. Nailers that shoot the biggest trim nails are usually finish nailers and range between 15 and 16 gauges. For finer finishes on door trims it would be best to use a finish nailer with a bigger gauge which means smaller nails. This makes a smoother finish because the small nail barely leaves a hole, leaving you with less filling up to do. Trim nailers are categorized by the thickness or “gauge” of the nails they shoot. The rule of thumb is that the bigger the gauge number, the smaller the nail it uses. Nailer that shoot the biggest trim nails are usually finish nailers and range between 15 and 16 gauge. A finish nailer is more for lighter projects and is often used for “finishing” a job or project neatly. Framing nailers are better suited for framing, wood siding and major carpentry work. This is often the heaviest duty nailer on the market. A finish nailer can be used to round off trims and moldings after using a heavier duty framing nailer to complete large wood projects. Not all finish nailers are operated with air although the majority seems to be. Some cordless nailers use a fuel cell for nail propulsion, which needs to be replaced every 500 nails or so. This is an extra cost you don’t have to deal with when using a compressor. The battery charged units do not have any of these requirements, making them the best option for cordless finish nailers which can be used anywhere and anytime as long as they are charged. The Hitachi NT65MA4 Angled Finish Nailer is durable and effective for installing trim moldings and window or door casings. This nailer accepts 15 gauge nails ranging in length from 1-1/4 inch to 2-1/2 inch at 34 inches. The angled magazine allows the operator to working tight corners and confined spaces with ease. The nailer is easy to load and takes up to 100 nails at a time. This finish nailer is our top choice because of its small size and angled magazine which is designed to get into confined spaces. Compared to other nail finishers on the market, this one comes out tops because of special features such as a fully adjustable exhaust and selective actuation switch. This nailer is very user friendly and can load up to 100 nails ranging in length from 1-1/4 inches to 2-1/2 inches. A reliable and consistent finish tool to have on hand. The Dewalt DC618K Cordless Angled Finish Nailer Kit has a good overall balance and will handle any job with ease. The engine design allows the finish nailer to work fast and consistently on both hard and soft joints. This finish nailer has a choice between two modes; sequential placements of each nail or bump operating mode for maximum speed. A six position dial enables you to select the exact depth setting for different sorts of applications without having to re-acquire each depth setting. This is most definitely a premium addition to the Dewalt Cordless tool range. Finish jobs off like a pro every time and without the hassle of gas or compressor cables. This nailer comes with a three-year limited warranty and two-year service warranty and is battery operated. The 18V battery can be used with any other 18V DEWALT Cordless finish nailer which makes it perfect for jobs where there is no available power source. A must have for every workshop or professional dealing with trim and molding applications (click here for alternatives). The high capacity magazine can take up to 100 straight finish nails which means longer working periods between reloads and the anti-dust cap keeps the internal parts of your finish nailer clean, even during storage. The NuMax SFN64 Straight Finish Nailer is designed to fire 16 gauge straight finish nails anywhere from 1 to 2.5 inches. This straight finish nailer is perfect for finishing off interior and exterior projects. It can be used on shoe and crown moldings as well as window casings or chair rail molding. Thanks to the nails small gauge which basically disappears into the wood, you will spend less time filling in and sanding holes. Even though these nails are small in size, they are quite strong and will soon become an essential part of your toolbox. When you need a finish nailer that is fast and effective but won’t break the bank, look no further than the NuMax Straight finish nailer. As always, make sure you know the safety rules of using this equipment, as this study explains. We hope you enjoyed our article on "The 10 Best Finish Nailers for Woodworking in 2019", if so, please share and rate it.